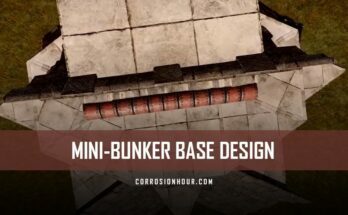 The Practical Bunker Base Design, a RUST base design from our partner xRaw, is a strong base design, costing more than 100 satchels to raid the golden path to the tool cupboard. 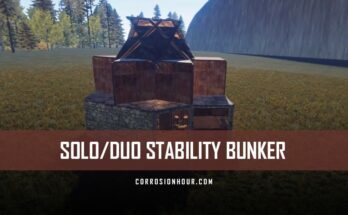 This RUST base design features compact item placements throughout, with a hard to raid tool cupboard. Inside the base, an advanced bunker base technique is used to secure the main storage and work areas, however, there is ample storage throughout the base design itself. Having one main entry point, this base may be best suited to be built up alongside a rock cliff or wall. There’s a large viewport, via the shop front windows, at the entry to help detect door campers before exiting the base. Coming into the base here, we have a few shop fronts so you have vision outside, as well as a repair bench and a research table. Coming into here is your first loot room. There’s four large boxes and four small boxes on each side. Going through the door here takes you to the decoy base. This is where the raiders will think your TC is but obviously it’s not, it’s in the bunker below. To get into the bunker you’ll have to do F1 kill, to spawn in your bag underneath. Once you’re in the bunker there’s plenty of boxes and furnaces down here, along with your TC. When you want to open up your bunker, destroy the twig and jump out. When you want to log off or close up the bunker, place the half wall back down. Jump out, place the floor down. Make sure to upgrade it so they can’t break it. Make sure to check out my $20 steam card giveaway, it’s in the description.